September 2017. Adnan Saleem Saqib has a wife and two daughters back in Pakistan. Before fleeing his home country for Germany two years ago, Adnan worked as an accountant. He studied economics and met his wife-to-be at university. They fell in love and married, without their parents arranging the marriage or first giving consent. In Pakistan, this is considered a gross violation of traditional conservative values. In October 2015, Adnan arrived in Bad Tölz, a small town in the Bavarian Prealps, a mountain range in southern Germany. It was at the height of the country’s refugee crisis. He quickly connected with Asylplus, a nonprofit organization helping refugees learn German. Adnan practices phrases and grammar on a Google Chromebook at the public library. Asylplus has equipped the library with Chromebooks from Project Reconnect, a program that provides free access to online language courses and exercises on the laptops. Asylplus also helps refugees find job training and internships. 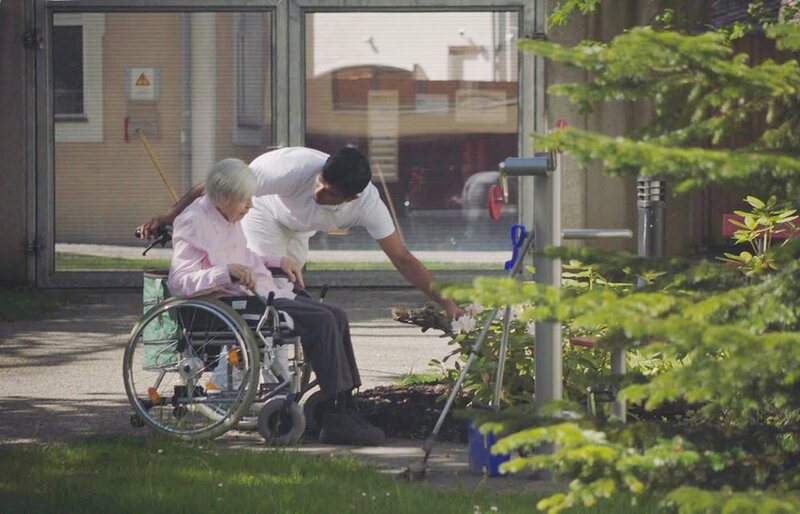 The organization landed Adnan a three-week internship at Josefistift, a home for the elderly in Bad Tölz. Though his year-long position has ended, Adan was accepted by an apprenticeship program training state-certified caregivers for the elderly. And this month, in September, Adnan began his apprenticeship at Josefstift.